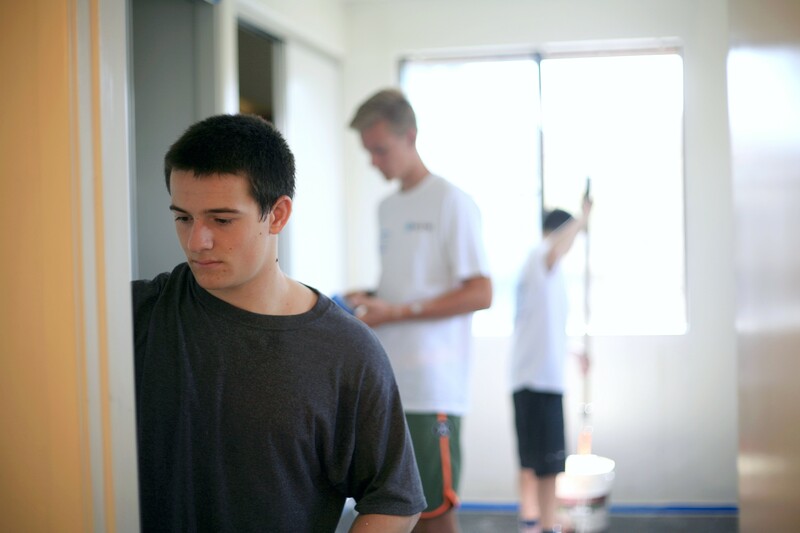 National League of Young Men members Ethan Zimmerman, 16, sophomore at Newport Harbor High School (front), Blake Richter, 15, freshman at NHHS (middle), and Jack Pritchess, 15, freshman at Mater Dei High School, paint one of the rooms at a Human Options housing location last weekend. The boys, joined by a few parents and workers from a family owned OC estate maintenance service company that donated their time and skills, painted the rooms, restored furniture, replaced carpet, and plumbing and electrical fixtures, and more. They also donated clothing, diapers, bedding, towels, and other items. Their sister organization, the National Charity League, donated funds to buy mattresses and bedding. It’s a “dramatic change,” said Melissa Walker, Fund Development Manager for Human Options. 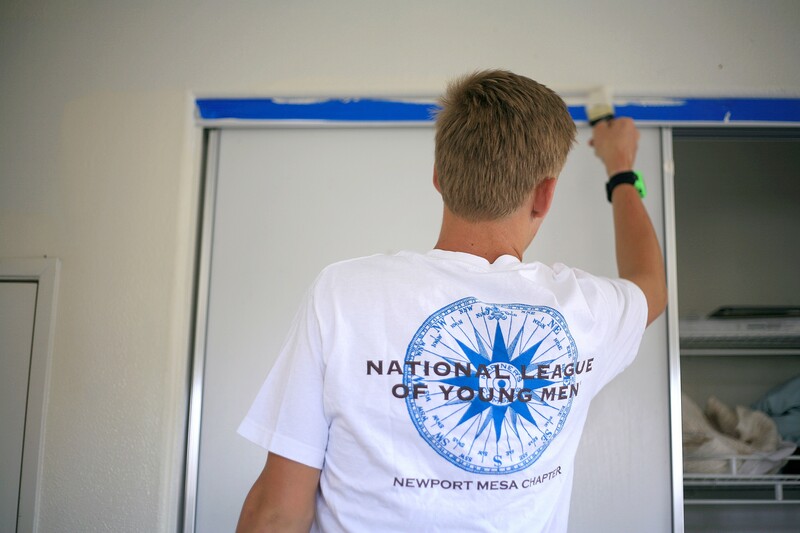 NLYM member Aidan Steinke, 14, prepares a room to be painted and refurbished at the safe haven location for women and children in the Human Options program. added. Families receive safe housing for up to 45 days, Walker noted, so the rooms get a lot of usage. It allows them to focus on rebuilding their lives, she added. After leaving a home situation with domestic violence, the women and children should feel safe and comfortable within the walls of their new home, said NLYM mother, Lorna Wardwell, who organized the project. 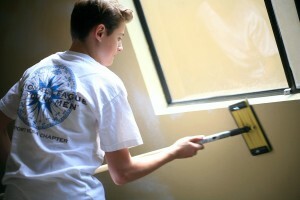 NLYM member Blake Richter, 15, works on a room at the Human Options housing facility during the refurbishing project. The young men are more than happy to help, she said. “It is truly heartwarming to see so many young men volunteer with their mothers and fathers to make a difference in the lives of others,” said Wardwell, whose son, Sam, 16, a sophomore at Corona del Mar High School, was among the boys working on the house. 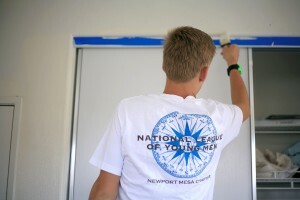 Other volunteers included Ethan Zimmerman, 16, sophomore at Newport Harbor High School; Blake Richter, 15, freshman at NHHS; Jack Pitchess, 15, and Aidan Steinke, 14, both freshman at Mater Dei High School; and Rory Sever, 15, freshman at Culver Academies in Indiana (Newport native visiting family and friends). 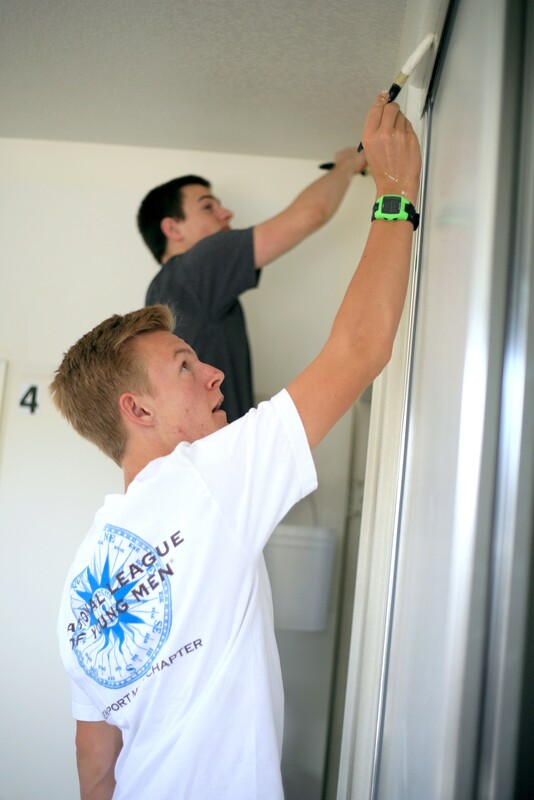 NLYM members Blake Richter, 15, and Ethan Zimmerman, 16, help paint a room at a Human Options housing location. “What they’re doing for these families is amazing,” he said. The rooms really needed to be fixed up, Zimmerman said. They were outdated, he added. Hopefully it helps them feel more at home and in a safe environment, Pitchess added. Human Options provides a 24-hour hotline to answer questions and provide referrals, an emergency shelter and a transitional living program, counseling and legal advocacy, and community outreach and education. It’s a comprehensive program, Walker explained. It can be very difficult to start over, she said. The women often have to uproot their entire lives, leave their jobs and the children have to change schools. “The goal is to get help women and their families to become self-sufficient and heal from the effects of domestic violence,” Walker said. 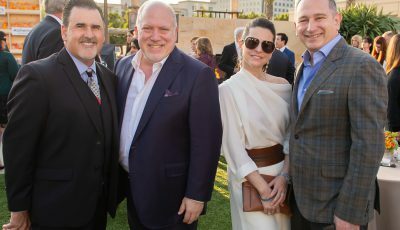 Everything from giving donations, helping with in-kind projects such as this one, to attending events and learning more about the issue will help. One in four women will experience domestic violence in their lifetime, she continued. It crosses all socioeconomic, cultural, and linguistic backgrounds, she emphasized. “Our program is working to break that cycle of violence,” Walker said. Several people and businesses contributed to the project: Grit Cycle (NLYM fundraiser host), Vintage Design/Jennifer & Tim Buckley (carpeting & installation), NCL (donating sidewalk sale proceeds), Home Depot (painting supplies), Anne Michaelson Design (coordination of services), Fiber Seal West (Upholstery Cleaning), American Sealers and Restoration (Tile floor cleaning), and Lalique Design (Valances). 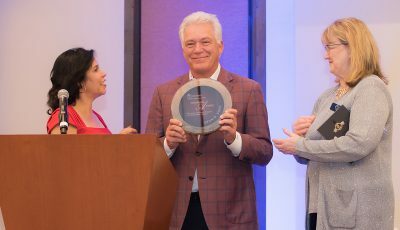 Human Options will host their annual gala at the Balboa Bay Resort on May 8 from 6 to 11:30 p.m. 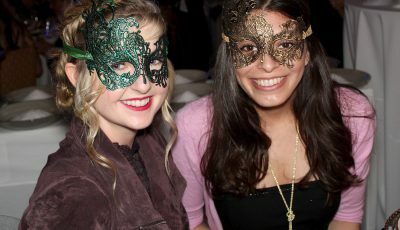 The “BLACK TIE MASQUERADE: An Evening of Serious Fun” will include dinner, dancing, live and silent auctions, and more. 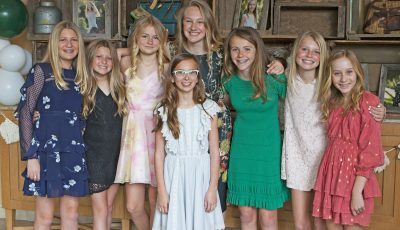 They will also host an educational luncheon in the fall. For more information, visit humanoptions.org and nationalleagueofyoungmen.org. Human Options can help 24 hours a day, seven days a week. 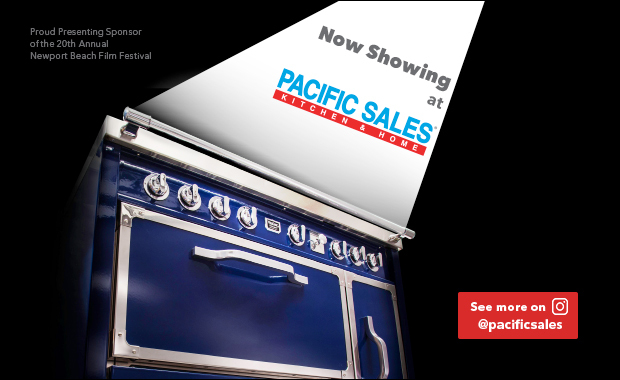 Call the bilingual hotline: (877) 854-3594.